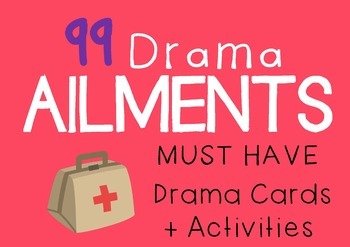 This set of 99 AILMENTS Drama Cards comes with suggested drama activities (Emergency Room; Mime Activity; Ailment Scenes) but can be used in so many more ways. Create great scenes with the help of these creative drama cards! 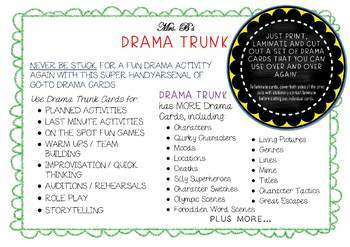 DRAMA TRUNK DRAMA CARDS ARE A DRAMA TEACHER'S BEST FRIEND! Just print, laminate (optional) and cut out a set of versatile drama cards that you can use over and over again. 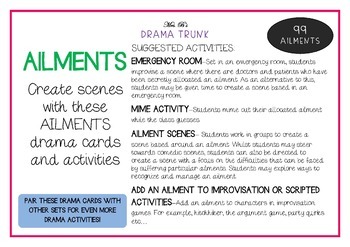 I cannot count how many times and ways I have used drama cards – absolutely my most handy drama resource. NEVER BE STUCK FOR A DRAMA ACTIVITY AGAIN! Combine the use of multiple cards for even more activities, challenges and ideas (you will have a HUGE amount of drama activities ready to go when needed). 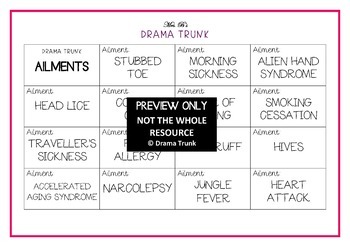 + MORE DRAMA CARDS AVAILABLE AT DRAMA TRUNK! Please note that this product is for personal classroom or home school use by a single purchaser only. You may not distribute, copy or modify this product other than for your own personal, non-commercial classroom use. © Drama Trunk. All rights reserved.